In the BAUER Maschinen Group, BAUER MAT Slurry Handling Systems, based in Immenstadt in southern Germany, is the specialist for mixing and separation technology. 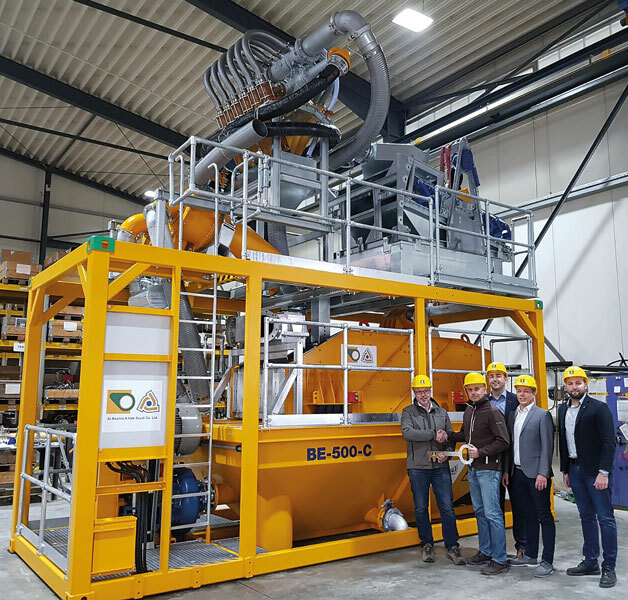 At the beginning of April, Branch Manager Alexander Konz, Sales Director Timo Seidenfuss and Kurt Ostermeier, Head of Product Management Mixing and Separation Technology at BAUER Maschinen GmbH, announced that a BAUER MAT BE 500-C – with the serial number 1,000 – was handed over to Frank Schwarzer, Managing Director of Tunnel24. “My business is based on customers’ trust that they are sold plants and equipment that meet their needs and that, at the end of the day, they can be economically successful with them. After careful consideration of all the options, our business partner Jim McNally from TBM Trading Middle East FZC in Sharjah, UAE, and we have decided to offer the BAUER MAT separation plants to our client Al-Rashid A.Hak Saudi Co. Ltd. from Saudi Arabia. These are made in Germany, are robust, durable and work efficiently. And should help be necessary, our customer can rely on Bauer’s proven worldwide service network. For us as vendors, these are the ideal prerequisites for maintaining our good reputation and further augmenting it, because only satisfied customers are returning customers,” Schwarzer said. The BE 500-C desanding plant with a throughput capacity of up to 500 m3 per hour is to be used in a microtunneling project in the Middle East. “Thanks to its compact dimensions, it is optimally suited for pipe jacking and subsurface construction projects using microtunneling,” Ostermeier said. The basic system used has been a BE 425, which, besides tunneling, also finds optimum application in slurry- supported drilling, cutting or grab works. The plant, which usually features a 75 kW motor, has been equipped with a stronger 90 kW pump motor. A big advantage of desanding plants of the BE series is their modular design: By addition of a prescreener they can be extended into large-sized plants with a capacity of up to 3,000 m3/h. For example, the BE 2550, which consists of six identical units of the BE 425-60, has set entirely new standards. It was used for the construction of the Swiss Eppenberg tunneling project in 2017, processing 2,400 m3 of slurry per hour – impressive dimensions that result from more than a quarter of a century of expertise in separation technology. “In 1992, Bauer – at that time still in Schrobenhausen where the Bauer headquarters are located – built the first desanding plant, a BE 150,” Ostermeier said. Soon other plants followed, which were manufactured in 1993 in Nordhausen, Thuringia, and from 2002 in Allgäu in southern Germany, after the production of separation technology had been moved to the local company MAT Mischanlagentechnik. Nowadays BAUER MAT Slurry Handling Systems, a branch office of BAUER Maschinen GmbH, develops complete systems for mixing and separating suspensions as well as centrifuges and pumps for all tunnel and specialist foundation engineering requirements. They are used worldwide in various grab, tunneling, airlifting or cutting operations, such as the Grand Paris Express infrastructure project, where the French capital is expanding its famous metro network by 200 km and is set to finish by 2030. “In addition to several Bauer trench wall cutters, a dozen of our plants are currently being used in the cutting works to build the new stations,” Seidenfuss said.